Color change and Birthday Celebrating!!! Well I was going to start this post all about turning 60 and everything that goes along with that but then I walked outside and noticed very, very bad smell. I am pretty sure that either there was a skunk incident on my front porch last night and it was afraid and then let it’s fear fly or it crawled under my porch and died or ( and this makes me wanna cry ) a skunk has decided to nest under my porch. I am seriously hoping it is not the latter. I have a small dog and three cats and the chickens and the cats would surely get sprayed and then there’s the fact that skunks really really like chickens. Oy. So this weekend I get to figure this all out. I have my fingers crossed and am hoping the smell goes away and that is the end of it. So a few newsy things first. If you are a Rockin’ Whorl Club member we were going to ship out early in the week by the locks were not dry. It has taken all week for them to dry and I have a huge dehumidifier in the dye barn. I am to blame I thought I had previously washed these but I had not! Anyway we will be packing it all up this weekend and shipping it out to you on Monday! Thank you for your patience! As I mentioned in last weeks newsletter our new price list will be going into effect on June 19th. Rockin’ Sock Club members you might want to use your 20% off coupon code before the 19th to take advantage of the current prices. we are raising prices a ton but every little bit helps. We have a few specials going on right now. 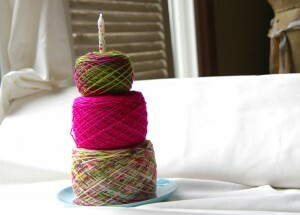 springtwistalong 25% off our Seduction and La Luna Lace for the Spring Hiatus Twist KAL good until June 1st. And then starting June 1 we have our Tour de Sock KAL discount which is good from June 1st to July first and you can find once you sign up for the KAL. Also I made two new colorways for this years Tour de Sock. I hope you love them as much as I do. I’m having a whole lot of fun with orange right now! 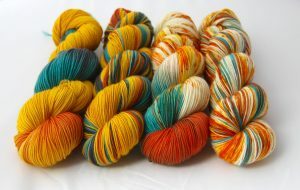 One of the new colorways I am putting up next week is a new Tipsy colorway, an orange one!! It time for a color change!! Here’s a list of the colorways that are going to have a bit of a vacation starting Monday! Okay now unto the fact that on May 29th I turn 60 years old. I know…how did that happen. Actually I am pretty thrilled to be here to turn 60 so I am celebrating with everything that I have and I would love for you to join me. Some of what I have a lot of is, love and gratitude laced with a fair bit of quirky. So we are going to be spreading both of these around in the next week. One of the ways we are going to do this is that everyone person who order from this moment in time until midnight May 31st gets a love note postcard from me in their package with a 10% off coupon good for your next order! We will also be randomly choosing from all of those orders 6 of you that win a skein of Socks that Rock of your choosing in a wonderful JAMPDX mug. We will also be choosing another 4 that will win a skein of our Yaksi Fingeringweight yarn in the color of your choice in a lovely Queen Bee bag! I know! I totally want to win these! And…if that were not enough and it is not. I would like to play an instagram game I just have not quite figured it out yet so stay tuned in the next few days for that! Here is our instagram feed. It’s been awhile since we had a tell me your color story and I will make you a colorway game so we are going to do that here on the blog. What you do is tell me a color story. I love a good story!!! I am not going to give you any limits this time. It can be any kind of story as long as you are descriptive. Try not to make it too long. I am in the process of training three new dyers so my attention span is a little low at the end of the day. Also that whole turning 60 thing!! You have until June 1st. 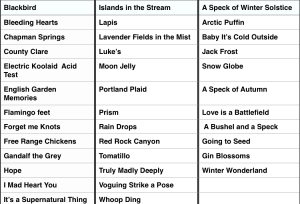 Then I will choose 4 of these stories and I will create them in living color on yarn. Oh I almost forgot. We have our dye camp sessions up!!! You can dye your own fade!!!! Have a great weekend. Enjoy the sunshine. 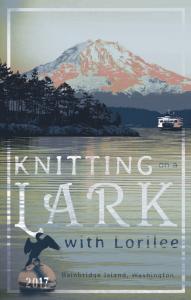 Oh and….if you need a lovely get away in a beautiful place with lovely people and yarn and good food and dyeing with me then check out Lorilee’s Knitting on a Lark Retreat in July.